The parish consists of about 6,500 acres of fertile farmland situated on the north side of the Bicker Haven, which was in mediaeval times a tidal inlet extending west and north from the Welland estuary towards the parishes of Bicker and Swineshead. The Haven provided an almost direct waterway link to the quarries at Barnack, near Stamford, which probably provided most of the material to build the original stone church. This link was via the River Welland, through Crowland and Spalding. The name Sutterton is said to derive from Sutari-tun, Danish for shoe maker’s farm. Certainly, there have been boot and shoe makers in the village until quite recent times. However, the origins of the real prosperity that must have existed in mediaeval times is not entirely certain. Traditional theory is that it came from salt production and perhaps the comparatively low areas in the middle of the village known as “the pools” played a part in this. It is clear that salt workings were generally situated close to salt water and that spoil heaps were an associated feature. These features are difficult to discern near the “pools”, so there remains a degree of doubt as to their origins and purpose. However, the value of agriculture within the parish over the ages is not in doubt and this remains the case today. In past times there have been at least two prominent families living in the parish. There is a commemorative plaque to the Massingberd family in the church. 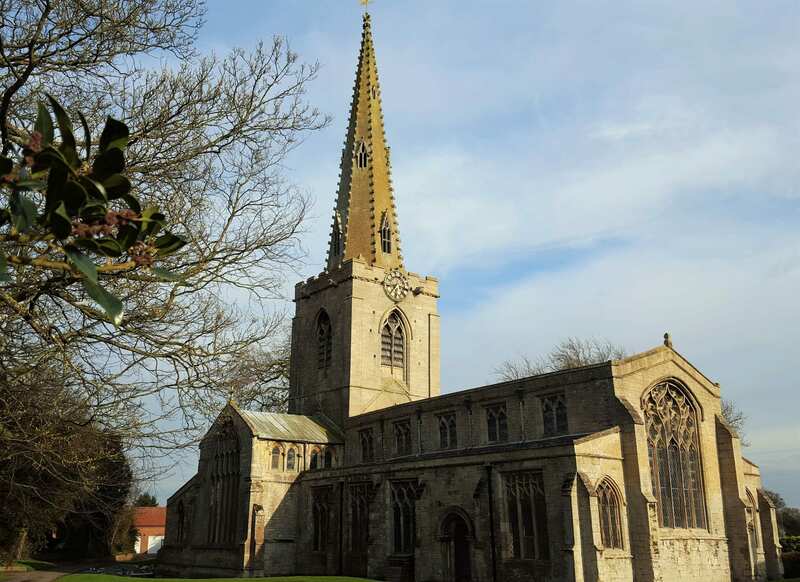 They had land and lived in the parish from the 13th through to the 17th C. According to various sources the Cranmer family lived in Sutterton throughout the middle ages until one Edmond Cranmer married Isobell of Aslocton in Nottinghamshire in about 1450. Edmond Cranmer was the grandfather of Thomas Cranmer, who became Archbishop of Canterbury and his brother, Edmond Cranmer, who became Dean of Canterbury. Archbishop Cranmer was burned at the stake as a heretic during the reign of Roman Catholic Queen Mary in 1556. The presence of prominent families in the village together with a high status church through the middle ages may be an indication of a particular form of prosperity that is unclear today and that is no longer evident, perhaps salt. Clearly, this is a puzzle that warrants further research. There is no sign of the Anglo Saxon church which was almost certainly a wooden building. 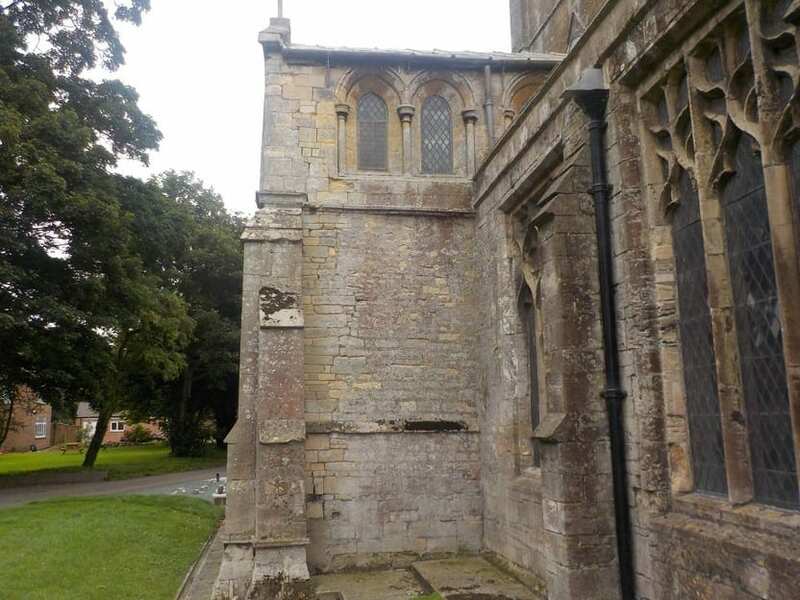 The present stone built Church is cruciform in shape and dates back to the second half of the 12th C. This is evidenced by many surviving architectural features. The church as it is now probably sits on a very similar footprint to the original stone church. It was built mainly of what are probably Barnack stone ashlars. Much of the stone is in its original place but some is where it has been re-used in changes to the building over the centuries. As time passed the building was altered to keep up with the fashions of the time and generally to enhance its status. In Victorian times there was significant re-building, particularly of the Chancel and South Transept. In 1862 this was overseen by the architect Edward Browning of Stamford. However, much of the original stone and special features were re-cycled so that the building did not become overwhelmingly “victorianised”. Alterations took place in the remainder of the 19th C including the installation of the pews, the tiled floors and walls in the chancel and the mosaic reredos. The Church is heated by a variety of overhead electric radiant heaters and electric under-pew heaters. These are inadequate when the weather is cold. There is no heating in the North Transept. The Church is Grade 1 listed. The interior of the Nave is dominated by the highly important late Norman arcades of five bays with five round piers to each side of the main body separating it from the side aisles. These piers stand on bases with angle spurs headed by square abaci with chamfered corners. 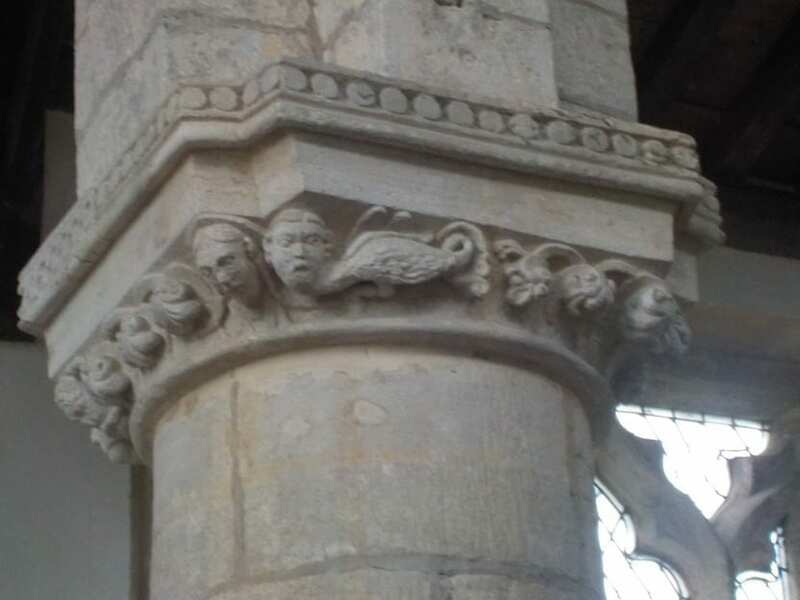 The capitals of the piers are each decorated individually with representations of leaves, waves, mythical creatures and heads. The most easterly piers lean sharply away from the crossing and their bases have tipped and subsided slightly, the piers towards the west also lean, but to a diminishing degree. The Nave is lit by square headed 14th C windows in the North and South Aisles and the clerestory together with the massive and splendid west window about which Pevsner rather uncharitably wrote: “…is an uncommonly wilful design. No-one can call it beautiful.” He says the window may date from the first half of the 14th C. Perhaps, the two oldest windows in the nave are at the west end of the north and south aisles. The windows are practically all clear glass so the church is particularly well-illuminated in natural light. Returning to the two western piers of the crossing which form part of the support the tower; the bases of these are below the present floor and therefore are out of sight. It can be seen that the lowest parts lean at a similar angle to the easternmost aisle piers. However, about 1.5 meters above the floor the crossing piers straighten to near vertical. The arches connecting the crossing piers to the aisle piers have an extraordinary shape that is necessary to accommodate the different levels and the lean of the aisle piers. 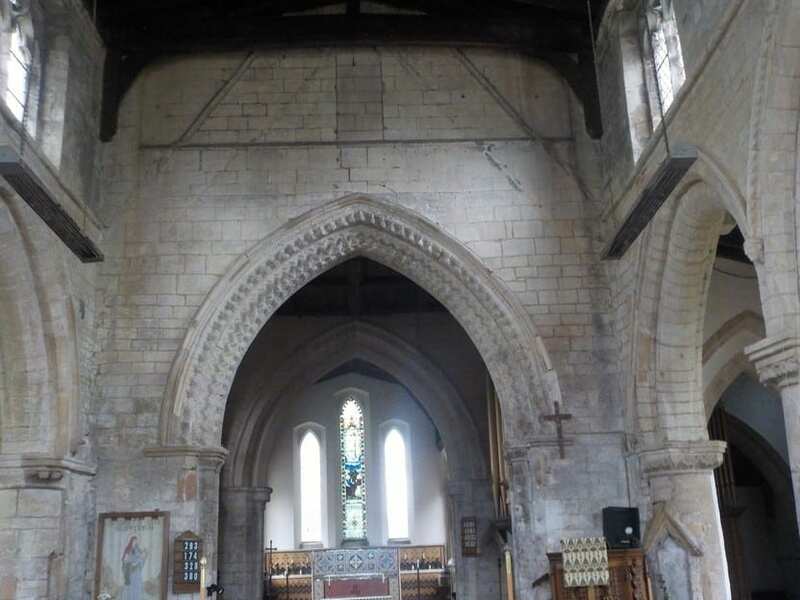 The important crossing arch overlooking the nave has the characteristic zig-zag decoration of the Norman era. There is an outline on the west wall of the tower, within the upper reaches of the nave, of what was probably the original roof of the nave before the clerestory was built. There is a further outline of a pitched roof on the west side of the tower above the present roof. This must have been the original steep pitched shape of the nave roof after the addition of the clerestory. This steepness indicates this roof may have been thatched. The present roof is timber covered in lead and inside the nave one of the main beams bears the date 1736 together two names, R. Jackson and E Thompson, presumably the craftsmen who built it. 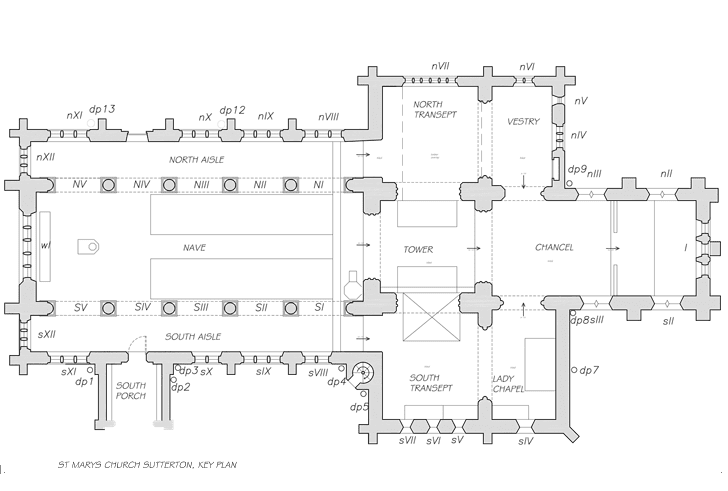 There is documentary evidence held in Lincoln County Archive that the north and south aisle walls were partly re-built during the Victorian re-ordering in 1862 . However, the original very important arch and surround of the carved Norman north door was left in place. D Stocker, in the Corpus of Romanesque Sculpture in Britain and Ireland has suggested that the decoration around the arch of the north doorway is one of the richest Romanesque survivals in the county and that it recalls the decoration on the North portal on the West façade of Lincoln Cathedral. Likewise, the south doorway is original and important. 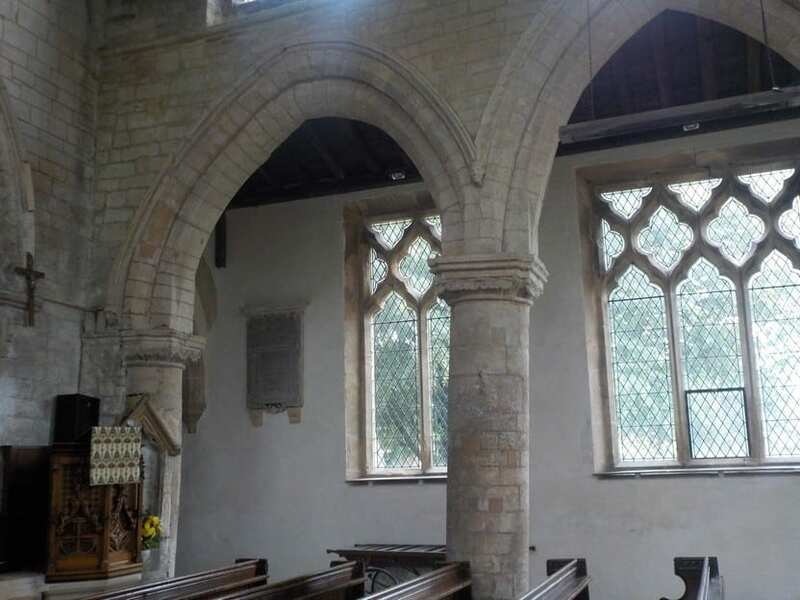 Writing about both doorways, D. Stocker suggests there are sculptural stylistic affinities between St Mary’s Guildhall in Lincoln and both North and South doorways at Sutterton. The floor of the nave is a mixture of stone materials. The pews are mounted on wooden staging that obscures a large area of floor below. It seems likely that the floor of the nave was not altered greatly in the Victorian re-ordering. 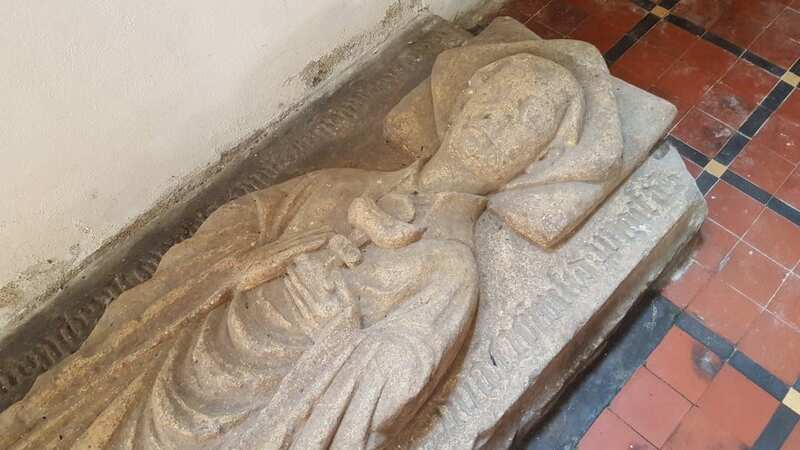 The evidence for this is the grave stones that form the floor of the central aisle remain as described in the early 19th C. before any of the major re-ordering took place. This impressive area of the building is dominated by the large perpendicular window. As in other parts of the church, it is possible to see how the building has developed over time. It is clear that there were major alterations to this part early in its life. The “added” clerestory and (probably) the present roof date from the 13th C. The original pitched roofline is evident from the outline on the tower wall within the transept. There must have been lancet windows where the great perpendicular window is now. (Rubble infill can be seen to each side of the upper part of the window.) The builders had to cut through the northern most beam of the present roof in order to fit in the perpendicular window. On the outside north wall of the transept some of the alterations are apparent where there has been infill with rubble and interruption to the string courses. The current vestry lies to the east of the North Transept and is separated from it by a 20th C Oak screen/partition in a medieval arch. The external walls were rebuilt as part of the 1862 re-ordering. This part of the church together with the Chancel and the south porch formed the major part of the re-ordering that was carried out in 1862/3. The walls, roof and window of the South transept were completely rebuilt, and the floor was raised. However, it appears the original footprint was retained together with internal walls and medieval arches. At present, the South Transept houses three recumbent 14th C stone figures. These represent John Boneworth who was priest in the parish in 1400 together with his mother and father. There is a report from 1834 indicating that these figures were standing up in the crossing. However, it seems unlikely that this was their original and intended position. There is no record to show why and when these figures were placed where they are and why it was thought necessary to “cement” them in place where they can draw moisture from the floor on which they rest and the adjoining wall. Certainly, the actions that were carried out were at least irresponsible. What is certain is that they need to be repositioned where they can be appreciated and safeguarded. This area is formed within the four great piers that support the tower. The ceiling is timber which forms the floor of the bell ringing chamber. The floor was tiled by the Victorians and they installed choir stalls to south and north sides. The arched opening to the south transept is closed off with an oak screen and the organ. To the north side the arch is open leading to the North Transept. The chancel was re-built as part of the 1862/3 re-ordering. The Lay Rector at the time, C.H. Cust, (son of Lord Brownlow of Belton House) took a great interest in the project. He was named in the petition seeking the Faculty for the work to be done and contributed a significant sum to reflect the cost of the work on the chancel. It is possible that much of the original window stone work was incorporated in the rebuild. Pevsner wonders if what can be seen now can be trusted as being from the 13th C. Notes on the Church made by William Monson in 1834 indicate that the east window had five lights instead of the present three and that the piscina was in the east wall, not as now in the south wall. It therefore seems likely that all the east windows are Victorian while those to south and north are, judging from the type of stone and imperfections, most likely to be reused originals. A picture exists by an unknown artist from the middle of 19th C giving a glimpse of the chancel before the re-ordering. In this there is no sign of the chancel roof above the walls. Documents in the form of correspondence relating to efforts by the Vicar to identify the Lay Rector (Thornhill papers in Huntingdon Records Office) show there had been great concern over the condition of this roof going back to the early 1800s. Be that as it may, the marks on the tower east wall indicates that there was a ridged roof originally, which became the template for that re-built by the Victorians. Fortunately, the Victorians re-incorporated an original and important double piscina and wide arched sedilia within the re-ordered chancel. 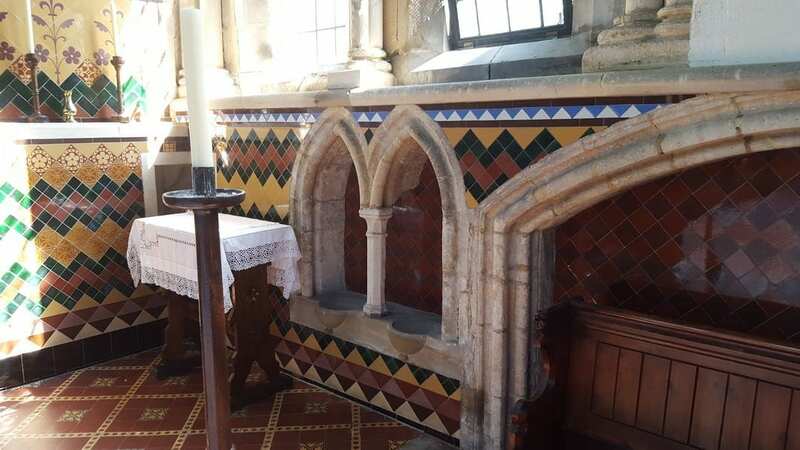 However, the dominant feature of the space is the Victorian tiling and mosaic on the walls, particularly in the east, plus the floor tiles that extend beyond the chancel to the choir and north and south transepts. This decoration probably dates from further re-ordering in the 1870s (Architect James Fowler). A description of the church from before the Victorian re-ordering documents the existence of two graves in the Chancel area. These are no longer visible. 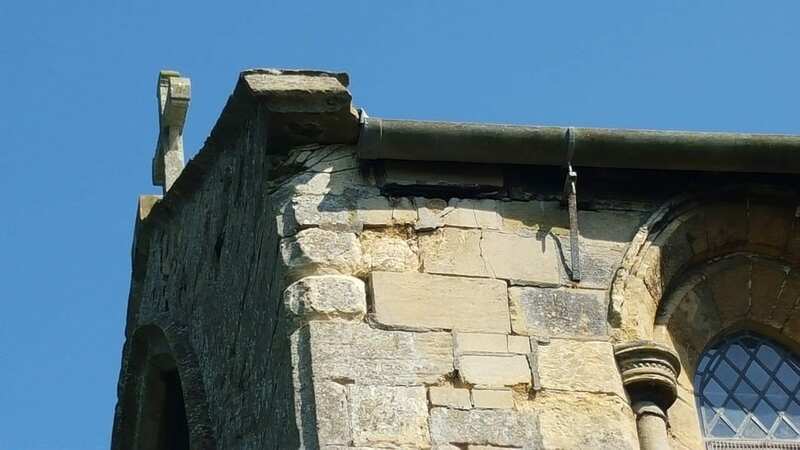 The recent advice to register Chancel Repair Liability (or stand the chance of the liability lapsing) led to an investigation by the PCC into where the liability (if any) lies today. Before 1772 the Lord of the Manor (Thomas Thornhill) collected tithes on land in the parish and as a consequence he had the responsibility of repairing the Chancel of the Church. In 1772, Holland Fen, which was a large area of land several miles to the north of the village where several villages had common rights, was properly drained and enclosed. Thomas Thornhill was granted for himself over 300 acres of the newly enclosed Holland Fen in lieu of the tithes to which he had been entitled. But, liability for repair of the Chancel was transferred to the ownership of about 200 acres of this grant and remains attached to that particular land to this day. The land has changed hands several times since 1772 and presently is owned by a trust, the beneficiaries of which are two individuals in Cheshire. The assertion of Repair Liability relating to the land is recorded with the Land Registry. The ashlar faced battlemented tower is topped by a fine 14th C recessed, crocketed spire that rises to a height of 160 feet (almost 50 metres). The Spire was re-built in 1787. 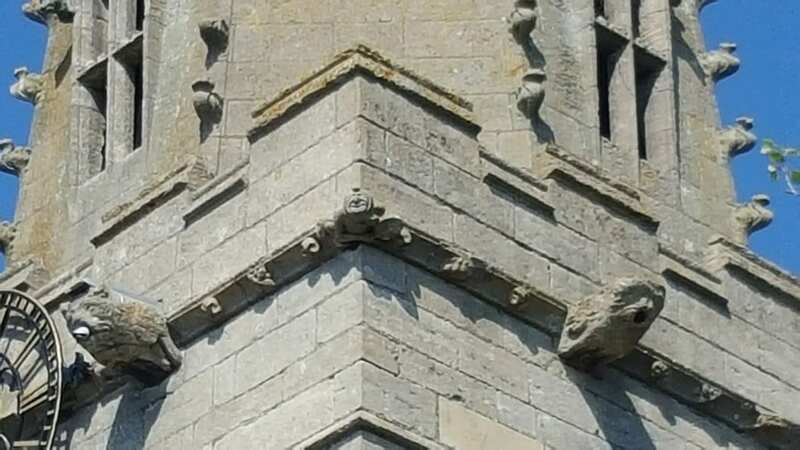 There is a frieze around the tower below the battlement. Incorporated in this are massive gargoyles, two on each face of the tower, with the exception of the west face where one is missing. The most interesting decorations in the frieze is at the corners. At the southwest there is a carved figure playing a drum. At the northwest is a figure playing a bagpipe. There is a carved figure at the northeast but the activity is difficult to understand. Another figure at the southeast corner is possibly playing a wind instrument such as a trumpet, but the trumpet (or whatever it was is lost. There are a variety of other splendid carved images in the frieze, including lions, other animals, heads, and ornaments. 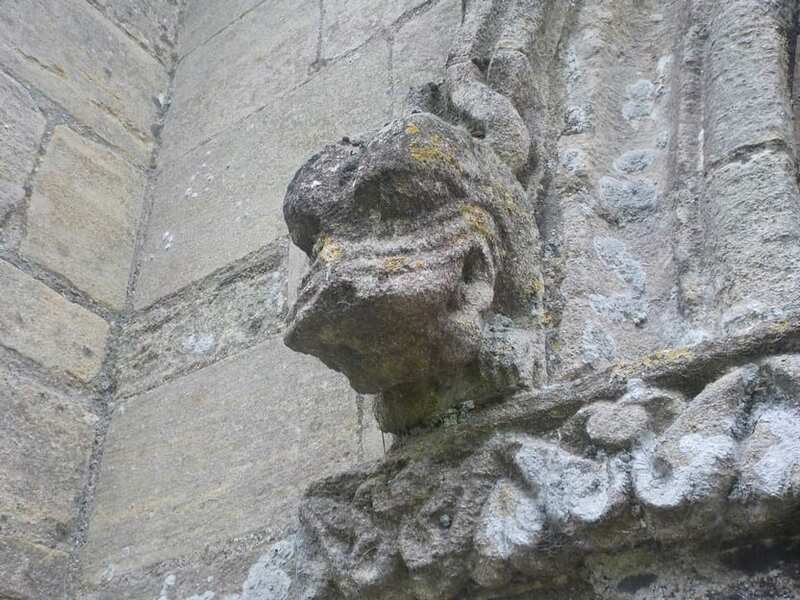 The spire is rich with carving, in particular the heads decorating the dormers. There is a Chalice and Paten of the year 1569 that are in customary use. There is a collection of fine brass objects, including two jeweled crosses, candlesticks, bookstands and plates. There are also a silver plated processional cross and another ornate carved wooden processional cross. There is a fine peal of eight bells with the heaviest weighing just over twelve cwt. The bells date from the 18th C but two were recast in 1937. In addition, there is Sanctus or Priest’s bell thought to have been made by Simon Hathfield of London in about 1353. The bells were re-hung on an iron frame with ball bearings by Taylors of Loughborough in 1937. The Churchyard is closed for burials except for the interment and scattering of cremated remains. Interment takes place in a formal gravelled area with stone tablet memorials. Scattering (i.e. unmarked interment in the ground) takes place in a quiet area to the south marked by a round slate stone. With the exception of two Victorian box tombs all the tomb stones have been laid down. Inscriptions on the laid down stones are largely indecipherable. There are a number of fine mature trees including two London plane trees, an oak and yews . These are not subject to any T.P.O. as the trees are not at risk. The Churchyard is home to a variety of birdlife, including owls.